Beautiful model perfect home with custom upgrades throughout home. 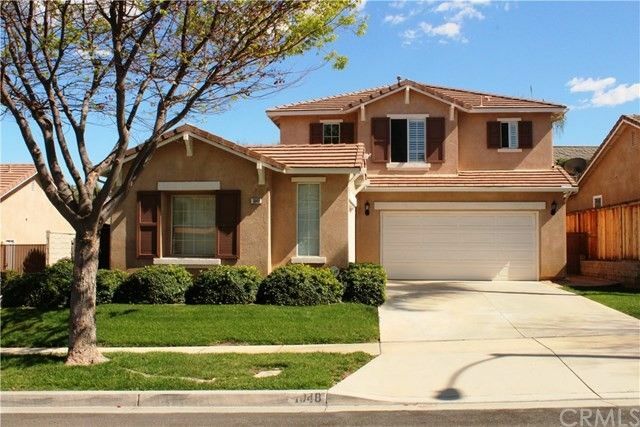 Located in the Mountain Gate community of South Corona. Large open Family room includes custom built-in entertainment center, plantation shutters, stone fireplace, custom ceiling fan and laminate flooring. Light and bright kitchen with beautiful granite counter tops, lg granite sitting bar, oak cabinets, walk-in pantry, stainless steel appliances and stainless steel sink. Separate breakfast nook with ceiling fan that opens out to private rear yard. Main floor office/den/bedroom. Formal living room or formal dining room. Upgraded neutral carpet, laminate flooring and custom ceramic tile. Custom paint throughout. Oversize master suite includes large closet. Master bath has dual sink vanity, separate shower and lg tub. 2nd and 3rd bedrooms includes ceiling fan, wood window shutters and Jack and Jill bath room. Open upstairs loft. Inside laundry. 3 car garage. Private rear yard, great for entertaining includes custom in ground spa, large custom built BBQ with sitting bar and patio cover with ceiling fans. Professional landscape and hardscape front and back. Close to schools, parks, shopping and entertainment.